Water leakage from faulty window and door flashing is one of the leading trouble spots in new construction. The damage, often hidden under the siding or within the wall cavities may not show up for several years. 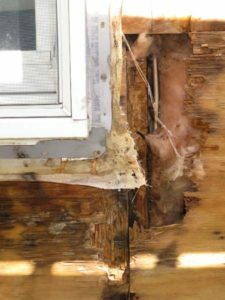 It may first show up as peeling paint around or below windows or water stains on the interior, but hidden damage to the sheathing, framing, and insulation can be more extensive and very expensive to fix. Damage from leaky window flashing has spawned a number of lawsuits by homeowners’ associations in large developments. It’s best to get this right when the house is built. Caulking under the window flange and Tyvek tape (the wrong product) over the cap flashing was all that protected this window. Properly applied flashing tape would have helped. The result was extensive water damage to the framing and sheathing along the bottom of the window. Roof overhangs. Not surprisingly the greatest leaks occur on windows exposed to a lot of rain. This is typically on the side of the house facing the prevailing winds during the rainy season. It is also more prevalent on walls with small or no roof overhang. In new homes, make sure your design has adequate roof overhangs on all sides. This is the first line of defense and will prevent against water leaks at windows and doors. 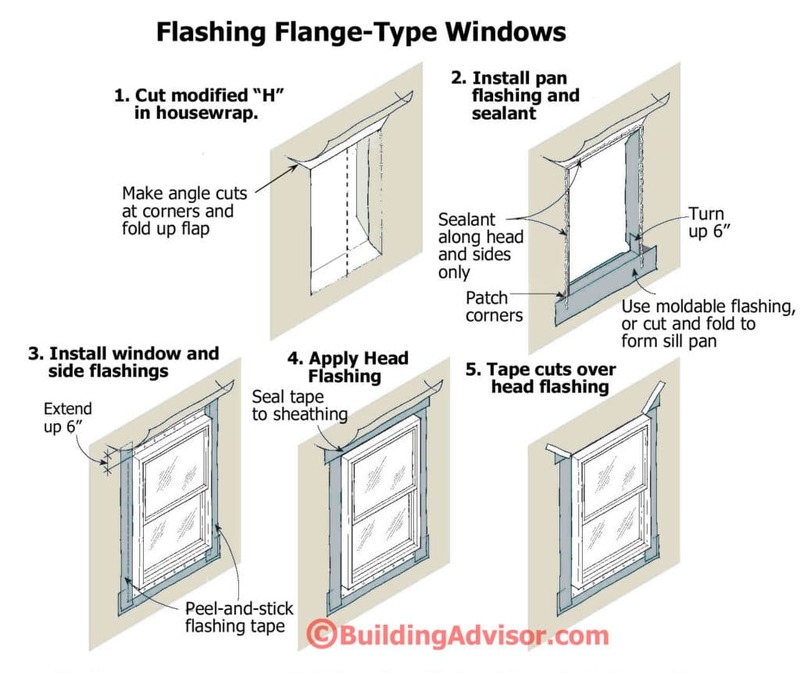 Flange-type windows. 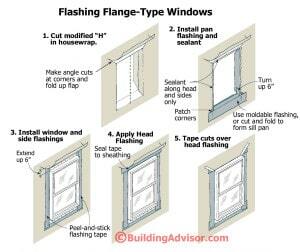 Most new windows have an integral nailing flange, either plastic or metal, that is nailed to wall to secure the window in place. The flange must be sealed to the surrounding walls and flashed to shed water. The flashing needs to be integrated properly with the house wrap and siding for the system to work properly. There is still some debate about the best way to flash this type of window, and most window manufacturers publish their own detail. Most published details follow the general approach shown below. The detail relies on sealant and peel-and-stick flashing tape, both of which are adhered to a plastic housewrap, a material notoriously difficult to stick to (see Illustration). CLICK TO ENLARGE Seal around windows carefully, paying special attention to the head flashing and sill pan. Moldable flashing tape is easy to form into an effective sill pan. For best protection, add a metal drip cap at the top of the window, caulked directly to sheathing. The key to success with any flashing detail is to follow the shingle principle, with upper layers of waterproofing materials overlapping lower layers, shedding water to the building exterior. This will continue to provide protection even if the sealant or tape fail over time as is often the case. Good workmanship is critical on flashings, but job-site realities don’t always match the precise technical drawings. The other key is good workmanship on the job site. In general, it’s easier to draw a tricky detail than to build it in the real world — with dirt, rain, time pressure, and workers who may not have the best training. The more fussy the detail, the greater the chance it will be messed up. This is one place where it’s worth extra supervision, inspection, or whatever it takes to get it done right. Following the shingle principle, start at the bottom with a sill pan (membrane, metal, or plastic), install the window, then seal the top, always lapping upper flashing layers over lower ones, shingle style. For the sill, moldable flashing, such as Tyvek FlexWrap, is the best choice as it is made to bend up the side jambs without stressing the material. Standard flashing tape is usually cut part way and patched at the bottom corners, a potential leak point. Flashing Tape and Sealant. While peel-and-stick flashing tape is very sticky stuff, it is not magic and will not stick to wet or dirty housewrap that has been exposed to the weather for weeks. It’s best to wipe off dirt, make sure the wood or housewrap is dry, and to press the flashing tape in place with a roller, as recommended by most manufacturers. Where caulk is required, choose a high-quality “sealant” approved by the manufacturer of the house wrap. Low-cost hardware store caulk will fail quickly. In the best of cases, however, you should not rely on tapes and sealants to stay stuck forever. The flashing should shed water even if the adhesives fail. NOTE: Do not caulk any horizontal joints above or below the window or any flashing. These should be designed to shed water to the layer below. Caulking will trap water instead of allowing it to drain. Window Cap Flashing. Before sealing up the top of the window, I prefer to install a traditional metal cap flashing. This helps direct water out away from window. In this type of installation, seal the cap flashing directly to the sheathing with high-quality sealant. Then place the top piece of flashing tape over the cap flashing and layer the house wrap over the tape. If you’ve added wooden trim around the window, the cap flashing goes over the wood trim. Pay attention to the ends of the cap flashing and make sure they extend slightly past the window molding. While the detail described above, if followed precisely, works pretty well most of the time, failures are still common. An expert who sees many of the failures is consulting architect Harrison McCambell, who gets called in to diagnose and fix buildings after they have failed. Writing in The Journal of Light Construction, the leading technical magazine about residential construction, McCambell attributes most of the problems to a combination of poor workmanship, material limitations (like stretching flashing tape beyond its limits), over-reliance on tapes and sealants, and the detail itself even when followed diligently. The corner patches, often used at the two bottom corners, are problem areas. Also conflicts between code requirements and manufacturers’ instructions lead to confusion about what exactly to do. The housewrap is cut flush to the opening on the side and bottom — no more flaps to wrap inward (sometime bringing water with them). The top flap is cut vertical at least 6 inches beyond the opening. 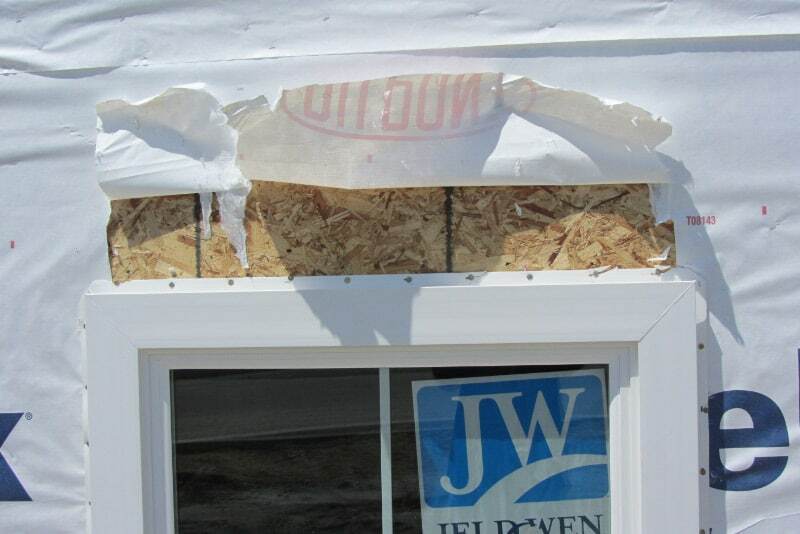 Jamb flashings are bonded directly to the rough opening since the flashing tape protects the wood framing more effectively than the housewrap can. Flexible/moldable sill flashing is turned up the side jambs only 0ne inch (rather than 6 in. ), and downward only 2 inches, which puts less stress on the corner points. The sill flashing laps over the housewrap or a separate piece of through-wall flashing needed for brick and other masonry veneers. While deviating from the window manufacturer’s instructions could potentially void the window warranty, McCambell feels (and I agree) the potential cost and liability of water damage far exceeds the dubious value of a manufacturer’s warranty. 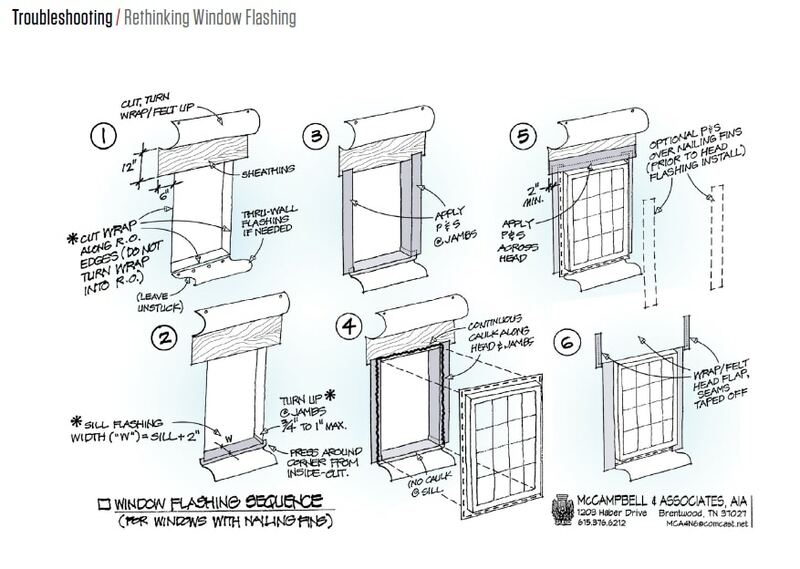 CLICK TO ENLARGE A better way to flash flange-type windows from forensic architect Harrison McCambell. Reprinted with permission from The Journal of Light Construction. You can read the full article at The Journal of Light Construction. Harrison McCampbell is a consulting forensic architect in Brentwood, Tenn., specializing in moisture-related construction defects. You can find him online at MCA4N6.com. I am looking for some well-illustrated details on how to flash an inset window. From the face of finished stucco and wood siding the window nailing fin is recessed 3-1/4″. From the face of finished stone veneer, the nailing fin is recessed 8-1/2″. Recessed windows are a challenge to flash properly and a common trouble spot for leakage. You are smart to develop a detailed plan ahead of time. Some guys try to puzzle it out on the job site, usually with poor results. While we don’t see this much in the Northeast, contractors in West and Southwest deal with this regularly on stucco exteriors and have worked out some reliable details often working closely with manufacturers. Creating leak-proof joints at the inside and outside corners at the bottom of the recessed opening is a big challenge. 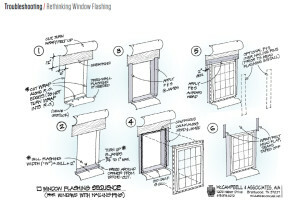 Equally tough is integrating the inner opening with the outer opening and tying the window flashing to the house’s water-resistive barrier (WRB or house wrap). It is critical that all materials are durable, compatible, and layered properly to drain to the exterior. It’s best to start with a sloped bottom sub-sill in the framed recess and to carefully seal all inside and outside corners. It’s possible to patch together corners with small pieces of peel-and-stick membrane, but it is much easier and more reliable to use pre-formed corners (available from Fortifiber) or a pieces of stretchable flashing such as DuPont FlexWrap, along with a compatible high-performance sealant. It’s best not to mix and match materials from different companies. Both Fortifiber and DuPont publish field-tested details for recessed openings. If you use the Zip System (Huber), they now offer a 10-inch-wide “Stretch Tape” that also works well for sealing complex joints. For recessed window flashing, I am most familiar with the details provided by Dupont and Fortifiber and have confidence in either approach: Dupont Tyvek and Fortifiber. Another option gaining in popularity is liquid or “fluid-applied” membranes. Huber makes a product called Liquid Flash that integrates with their Zip System. Dupont’s product is called Tyvek Fluid-Applied Flashing & Joint Compound. Fluid-applied membranes have been used commercially for a number of years, but are finding their way onto more high-end residential projects. While the materials are more expensive than sheet membranes, the installation is much simpler and it is the closest thing to foolproof that you will find for recessed windows and other head-scratching flashing details. 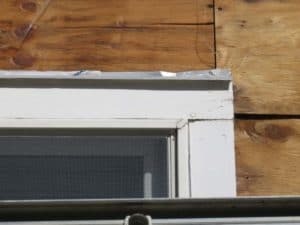 Is aluminum flashing recommended for new construction on windows? Aluminum is the most common material for window cap flashing and other wall flashings in the US because it is inexpensive and works pretty well in typical conditions. Use minimum .019 in. stock — the heavier the aluminum the better — and prefinished aluminum will hold up better than “mill” finish. However aluminum flashing is not recommended for use in contact with pressure-treated wood or masonry materials (concrete, stucco, brick, etc. ), or in coastal areas or areas with a lot of air pollution. All of these conditions can lead to pitting and corrosion in the aluminum. For difficult conditions, you might want to consider copper, which is very durable but expensive. PVC is another option popular with some builders. A good quality, heavy-gauge plastic should last as long as vinyl siding, but over time can get brittle and crack. Also it is vulnerable to damage in freezing weather. A solid drip cap made from Azek or similar plastics is another choice that will last indefinitely, but does not provide a leg up under the housewrap like a standard metal drip edge. 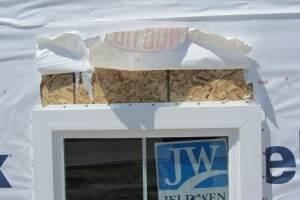 Around the sides of the window and at the sill, it is best to use peel-and-stick membrane flashing properly integrated with the housewrap or building paper. My house was built in 2001. The living room has a 2×8 wall. As a result, the aluminum windows are recessed. The sill angles down from left to right, a design detail, which has caused leakage. I’ve now exposed the Protecto Wrap flashing underneath and plan on re-flashing a sill pan. The problem is how to apply self-adhesive butyl flashing, such as Dupont Flex Wrap NF, without being able to overlap from top to bottom, as only a small segment of the jams have been exposed to access the leak area. Is there a common technique for such a situation? I am not aware of any standard approach to this problem. Each situation is unique and needs a custom solution tailored to the particular materials and field conditions. Important details include the type and condition of the window (with or without a nailing flange), sheathing, housewrap siding type, and original window flashing. Materials that are in poor condition may be difficult or impossible to seal to. How much access you have from the interior or exterior will also limit what is possible in a retrofit. A flexible flashing membrane such as Flex-Wrap is a good choice for a form-in place sill pan if you have room to install it. Otherwise, a preformed metal flashing may be easier to slip into place. While the standard recommendation is to turn the sill flashing up 6 inches at each side jamb, a few inches should be plenty as the water is not going to run uphill here. Leakage consultant Harrison McCambell recommends a turn up of only ¾ to 1 in. to relieve any stress at the corner points where the flashing must fold three ways – down the wall, out on the sidewall, and up the jamb. View this detail here. Since your jamb slopes from left to right, an unusual detail to be sure, you will want the turned up leg taller on the low side to prevent any water buildup from reaching the top of the turn-up. If possible, you want to slip the sill pan membrane up under the house wrap or flashing membrane from above. If not, you will have to seal over the jamb and sidewall flashings and rely on the bond of the Flex Wrap. Prep the existing surfaces as best you can, make sure they are dry, clean, and unwrinkled, and apply pressure to the overlap area with a roller or block. You’ll also want some type of water “back-dam” at the back of the sill pan — or a sill pan that slopes to the exterior. A dam can be created with a small length of wood under the membrane at the interior edge of the membrane. A slope can be created using a piece of beveled wood siding under the sill pan membrane. With a metal flashing, use a short turned-up leg on the interior edge of the pan. The corner points can be soldered to prevent leaks or sealed with a high-quality sealant. The important thing is to keep the water from leaking into the frame wall or interior – and to get it to drain safely to the exterior.